When Lewisham Council spends £4 million annually on providing temporary accommodation, and the borough has one of the highest levels of rough sleepers in London, why are newly-built apartments allowed to stand empty? And why is the council allowing the same developers to wriggle out of their commitments to improve public realm, plant trees and provide disabled parking spaces? This development on the corner of New Cross Road and Watson's Street has been finished for more than a year now. The red brick building which faces onto New Cross Road and the smaller, grey/brown bricked block are part of the same development by Kitewood Estates which created a total of 44 new homes; 35 for private ownership and 9 for social rent. The flats for social rent are located in the lower block on Watson's Street, at the end of the development furthest from New Cross Road - the entrance, or 'poor door', to the social housing is in the extreme left of the picture below. Not a single one of the private flats, which have separate entrances closer to New Cross Road, is occupied; they have lain empty since the block was finished. The entrance to the low-rise flats has a sign propped in the window warning that the properties are protected by a security firm; the corridor leading from the street to the flats on the main road still has protective covering on the floor and several notices in the door warning that entry is forbidden and giving a phone number for deliveries. The casual passer-by might be forgiven for thinking that the blocks are still under construction - the large retail units at street level have been boarded up since being built, and the patchwork of footpath and public realm on Watson's Street is clearly nowhere near finished. But the social housing is already occupied and the pavement has been like this for months. Surely this is not how it is supposed to be? 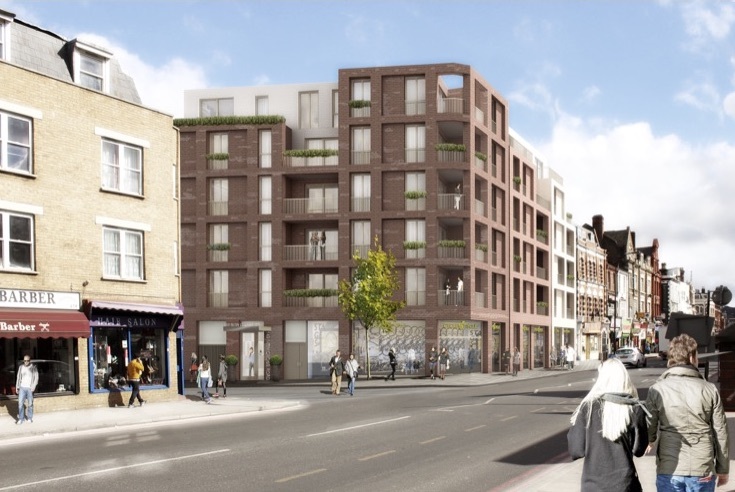 Indeed not - the planning application for the block (which was initially refused by Lewisham Council but which was passed at appeal) gives details of the soft landscaping and public realm improvements that the developer was promising. You can get a clue from the rendering below, although for the full details it's necessary to go to the drawings. The plans promise six semi-mature trees (five London Plane trees, and one Tulip Tree) and six Witch Hazel shrubs next to the block, to soften its hard edges no doubt. Three mature trees were removed so that the block could be built. 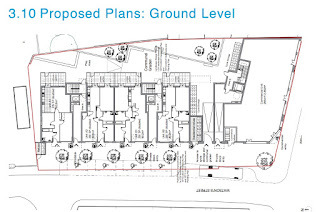 The soft landscaping was even made one of the conditions when the application was given permission at appeal. All planting, seeding or turfing comprised in the landscaping scheme hereby approved shall be carried out in the first planting and seeding seasons following the occupation of the buildings, or the completion of the development, whichever is the sooner. Any trees or plants which within a period of 5 years from the completion of the development die, are removed or become seriously damaged or diseased, shall be replaced in the next planting season with others of similar size and species. 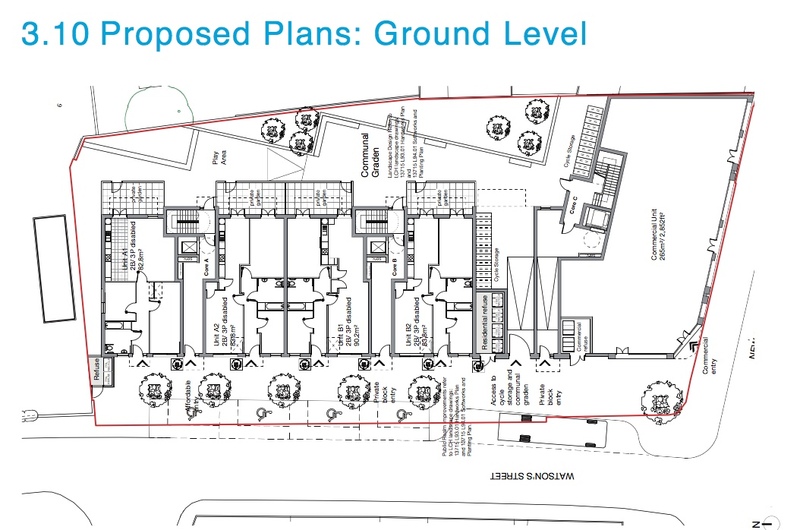 As well as soft landscaping, the plans included the creation of four disabled parking bays (the ground floor flats are designed to be accessible for wheelchairs) and a delivery bay, presumably to service the retail units and/or allow parking for refuse collections. Instead there is a mish-mash of asphalt, a wave of shabby paving stones that hug the edge of the block for dear life, and remnants of the concrete pavement that dates back long before the building work started. If you're walking down here watch your step, especially if you are old or unsteady on your feet - pity the few new residents who have to negotiate it on a daily basis. When developers fail to deliver on this kind of commitment, and bugger off leaving the job unfinished, it's down to the council's planning enforcement team to sort it out. Officers have the power to investigate breaches and ensure that developers don't get away with cutting corners. But Lewisham Council's planning enforcement team had other ideas. After the Deptford Society brought it to their attention last year, an 'investigation' was launched. A copy of the officer's report, which was issued to the Deptford Society last week when they chased the issue up, came into my possession. The report makes interesting, if jaw-dropping, reading. Responsibility for enforcing the construction of disabled parking bays was dismissed with the excuse that "if parking is required to make the scheme acceptable then it would have been specified by the planning inspector as a condition for the development". "The aerial photos shows that the soft landscaping scheme has been substantially implemented; to the extent that the aerial photos only show a minor difference to what was approved as part of the appeal decision. The information gathered as part of the desktop study demonstrates that the conditions have been substantially met, and that any breaches of the planning conditions are only minor in nature." Allowing a public pavement to be left in this state can only be described as negligent - not to mention a personal injury claim waiting to happen. And who are the villains in the piece? Which money-grabbing developer is responsible for leaving newly-built flats empty while housing is in such short supply? Ironically, while the original development was the work of Kitewood Estates and they are most likely responsible for the unfinished state of the public realm, since July 2016 the entire block has been owned by London & Quadrant Housing Trust, bought at a cost of nearly £15 million. 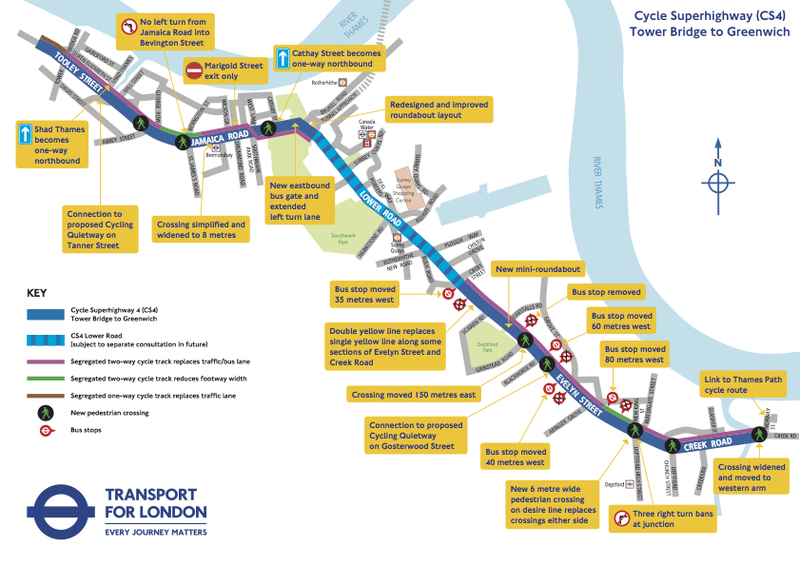 TFL is rolling out plans to expand the cycle superhighway network across this part of London, and is currently consulting on proposals for a new route between Tower Bridge and Greenwich. 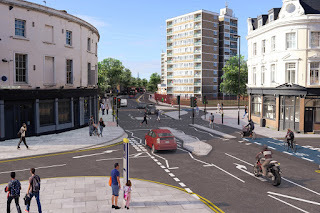 As well as creating fully segregated cycle lanes along the entire road, a whole host of other improvements are planned, not just for cyclists but for pedestrians as well. Simplified pedestrian crossings and improvements to public realm are proposed; one bus stop fewer is proposed for the Deptford Park section of the road, and most of those along Evelyn Street are set to be moved one way or another to make spaces between them a bit more even. The overview map is shown below - there's no detail as yet on the plans for Lower Road, apparently this is still in consultation with Southwark given that the area around Canada Water is due to be heavily redeveloped in the near future. 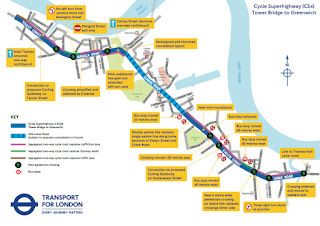 The plans so far show the segregated cycle lanes crossing from the north side of the road to the south side just before Southwark Park, so that cyclists and motorists will no longer come into conflict on the unpleasant Rotherhithe roundabout. Further along on Evelyn Street they are back on the north side of the road, but as yet there are no suggestions as to where or how this will happen - presumably at one of the junctions that is earmarked for full remodelling. Plans for the bottom end of Deptford High Street are shown below - the current situation top (although this is now slightly out of date with the new, widened pavement already in place) and the proposed segregated lanes on the second image. 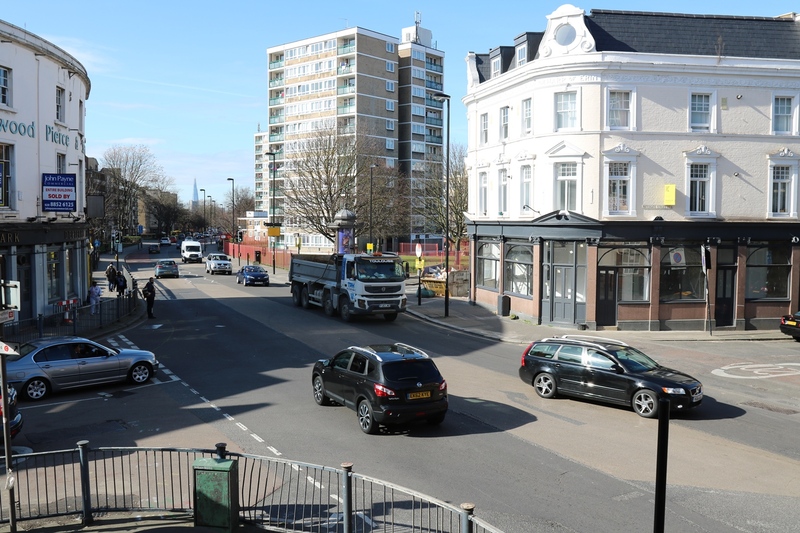 The main change to what's there now are restrictions on right turns and the removal of the two pedestrian crossings, which will be combined into one single crossing and brought much closer to the end of the high street. Motorists will no longer be able to turn right out of Deptford High Street towards Greenwich, nor will they be able to turn right into DHS from the Greenwich-bound lanes of Evelyn Street, which makes a lot of sense in terms of simplifying the situation for cyclists and pedestrians here. There will also be a ban on right turns out of Watergate Street. Being a regular cycle commuter I'm firmly in favour of this proposal, and having used the segregated lanes in central London I relish the idea of similar facilities in our local area, making bike travel safer and easier for everyone. Consultation is open until 19th November and there are plans available in the Deptford Lounge and Canada Water Library throughout the consultation - there's also a consultation event at Deptford Lounge this weekend where TFL staff will be present to answer questions (see below). The online consultation has links to much more detailed maps of each section of the proposed route.